So I’ve been having some trouble writing my memoir the last couple of days. It’s just been going like I’ve been writing with shards off glass on sandpaper. I hate it. I’ve been typing a lot recently, and it’s a different process than I’ve used before. I always started out with a pen and paper and wrote the entire story by hand — then typing up the document at the end. 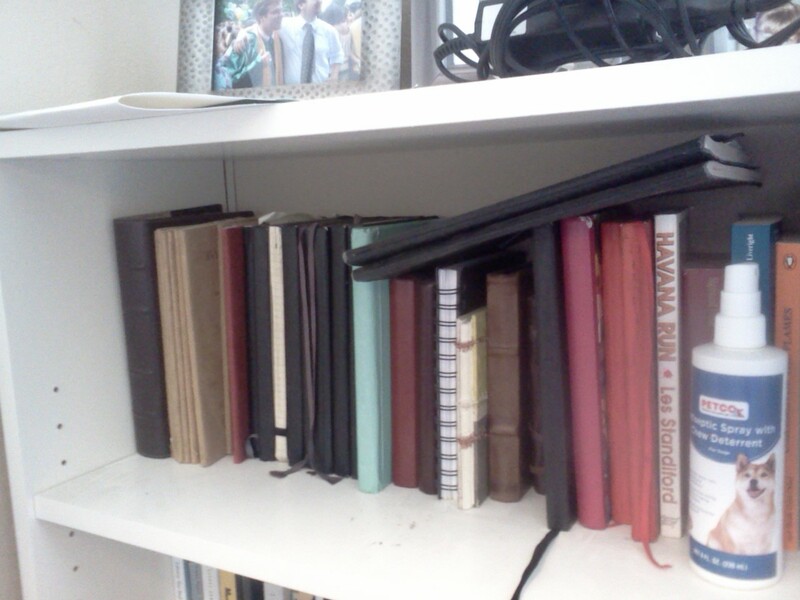 My journals on the shelf. Well, I realized earlier today this was my problem. There is something just too robotic, uncreative, mechanical about typing. It makes me feel like I’m transcribing from a metal box rather than the unconscious. So, I’m going to head back to that routine and see how it goes. But it made me reflect some on the importance of journaling. When I was in Paris, I wandered around a lot by myself. I just walked around at night, and I remember I walked down the stairs at Le Petit Pont to sit by the Seine River and write. It was night, and the Notre Dame was behind me. I watched someone inside turn the lights off in the famous cathedral. So I sat on the cobble stones, when a man in a full suit walked up to me. I was sitting next to a trash can that was overflowing, and it kind of smelled. The man said to me, “If you keep a journal, then a journal will keep you.” It was like a dream. I couldn’t believe it happened. I will never forget what that man said to me. “A journal keeps you.” Well, I look on my shelf, and I see all my journals. I have about 20 or so. That’s where I am kept. I exist within those notebooks. My thoughts, my journey, my dreams, it’s all there. And it’s only for me. And it’s also the journey I took to learn how to be a writer. Every time I take a road trip, I bring my journal. I make sure to document as much as I can, while still living the experience. But to me, writing about my life, writing about my thoughts, is my way of understanding my world. Because the only way I really know how to think, to know something true, is to write about it.